operations and improved efficiency? How can they best be designed to achieve this, on both older facilities and new ones? CGI - Finding and Delivering Business Value with Digital Technology. Most of the discussions so far around 'digital' and 'offshore' have focussed solely on the data and technology itself. As though all you need to do for good decision making is just get good data. But experience shows that data only supports decision making when it is carefully modelled around the way people work and make decisions, so people can see what they need and understand what they are looking for. We'll look at how this is being achieved. The most valuable IM managers, maintenance managers and engineers, IT managers and data co-ordinators of the future could be the people who develop the skills to build and implement digital technology which can best support understanding - rather than just skills working with the data and technology itself. Our forum on Nov 27 shared some ideas about how to do this. 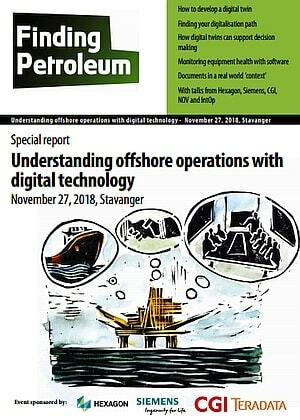 Offshore drilling, subsea, fixed platforms and floating production systems, Siemens real-world deployments of scalable, software solutions are helping upstream customers optimize decision-making to increase productivity, maximize capital efficiency and improve safety and security. Learn how to turn your data into value throughout the entire value chain. MindTwin integrates designed data provided by COMOS software with real-time operational data provided by XHQ Operations Intelligence Software. 3D visual context is also integrated into the solution and comes from COMOS Walkinside. The portal is web based on Siemens IoT cloud platform MindSphere, which adds analytics capabilities that learn from your data and help to make predictions.